This is the best shot I could get of Oliver whilst trying to be quiet and sneaky, he's a big time belly sleeper! I wanted to share with you all how we managed to get Oliver sleeping through the night from 6 weeks old. Since then he has always been a fantastic sleeper, usually doing around 11-12 hours per night unless he is ill or teething. Obviously part of it is down to your baby - some babies are naturally good sleepers, some cry more than others, some have problems like colic. Oliver was also bottle fed, which I know can lead to babies sleeping earlier than those who are exclusively breast fed. However, I do believe that routine also had a massive part to play in why Oliver slept through from such a young age. From the moment Oliver was born he had a routine. During the day time he would typically have his bottle, have his nappy changed, some cuddles and then be put down in his moses basket. We rarely let him fall asleep in our arms or rocked him to sleep. From being a newborn he was used to being put down in a moses basket on his own to sleep, so he never knew any different or longed to be held to sleep. We also made sure he knew the difference between day and night. During the day he would be put in a room that let in some light and we were never conscious of noise. We wanted him to learn that during the day time was when people were awake and moving about, where as night time was for quiet and sleeping. At night time we had a different routine. Starting around 5pm he would have a bath, then a bottle, then be placed down in a dark room to go to sleep. We did this even when we knew he would be waking up in 3/4 hours for another feed. He began to feel secure in his routine because he always knew what was coming next and at 6 weeks old he slept through from 10pm until 6am. At around 12 weeks old he began sleeping for longer periods and he would have all of his bottles during the day, effectively dropping the night/evening feed. It was at this point that we moved him into his own room. I know a lot of people advise that you wait until 6 months to transition them into their own room, but we did what we felt was best for our baby. As he was in bed by 6pm, we found we were disturbing him when we had to come into the bedroom to get ready for bed, grab something or go to sleep ourselves. 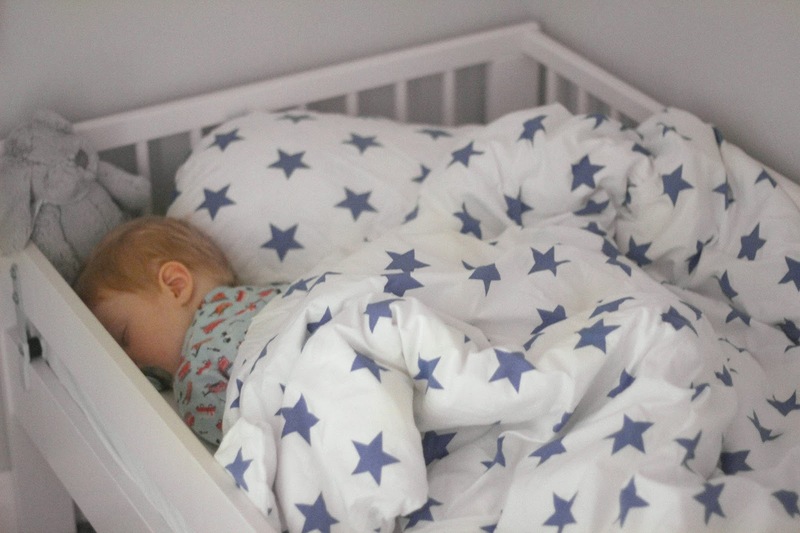 He did fantastically well in his own room and because he had never become accustomed to co-sleeping, being held or rocked it was completely normal for him to go to sleep on his own. I know some people love co-sleeping and it works really well for them, but it was never something we considered. I am an extremely light sleeper and also very paranoid, I know I would have been terrified to be in the same bed with him. On a more selfish level, we also wanted our evenings back. Time alone and as a couple is so important, I really cannot stress that enough. I didn't want to have a baby who wanted to sleep with me 24/7 or needed to be held all the time. Of course if he had been the sort of baby that wanted to be cuddled a lot we would have done that, and he had his fill of cuddles in the day time, but I didn't want to be sleep deprived for months as that isn't healthy for anybody. Oliver also has a dummy as his main comforter for sleep, but we rarely give him it during the day unless he is ill. We will be weaning him off his dummy fairly soon so wish us luck for that one! I hope this post has been helpful if you are having a baby soon/have a child that is reluctant to sleep. Let me know what your top tips are for getting babies to sleep in the comments.